1908: The Roundel began its life as a red, glassy, enamel disc crossed by a blue bar and was called, simply, the Bar and Circle. It was used to make platform names stand out. 1911-12: As there is no set typeface, or guidelines, the Bar and Circle are used imaginatively by various artists. Also, the letters 'U' and 'D' begin to appear on the logo. Then, in 1912, the London General Omnibus Company becomes part of the Underground Group. Thus begins a way of unifying the two company logos. 1913: Frank Pick, a publicity manager, commissions Edward Johnston, a typographer, to design a typeface for the new company. 1914: The Metropolitan Railway, in an effort to establish their independence, introduce their own version of the Roundel, which consists of a blue bar across a red diamond. 1916-17: With its new typeface the Roundel is registered as a trademark. 1920-33: Several different versions of the Roundel are designed in an effort to unify the symbol for the various parts of the organisation. 1933: A winged logo is chosen, by the newly formed London Passenger Transport Board, but it is shortlived. Edward Johnston sets about redesigning the symbol to better reflect the company. 1935: The bus stop Roundel is redesigned by Hans Schleger, who keeps the colours but removes the outline. 1938: London Transport establishes guidelines for the precise usage and design of the Roundel, when it issues a 'Standard Signs Manual'. 1947: London Transport is nationalised, but the Roundel stays. 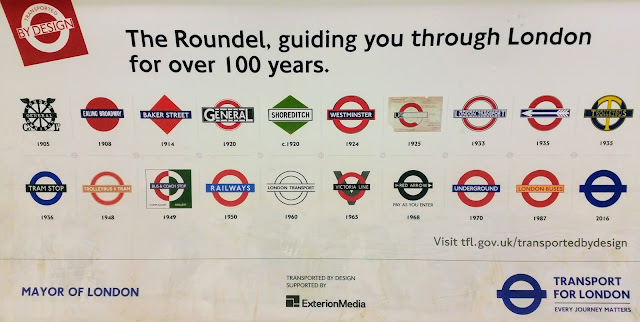 1972: The Roundel is named as the official corporate symbol of London Transport. 2000: Transport for London is founded to take control of London's transport systems. These include: The Underground, London Rail, Docklands Light Railway, London River Services, Trams, buses, Victoria Coach Station, taxis, London Transport Museum and Street Management.